On Wednesday night, The Dallas Mavericks made their lone regular season visit to Madison Square Garden to face the New York Knicks, which means that--barring an extremely unlikely Knicks-Mavericks NBA Finals--Dirk Nowitzki made his last appearance at the arena often referred to as the Mecca of pro basketball. This was also my first trip to Madison Square Garden. 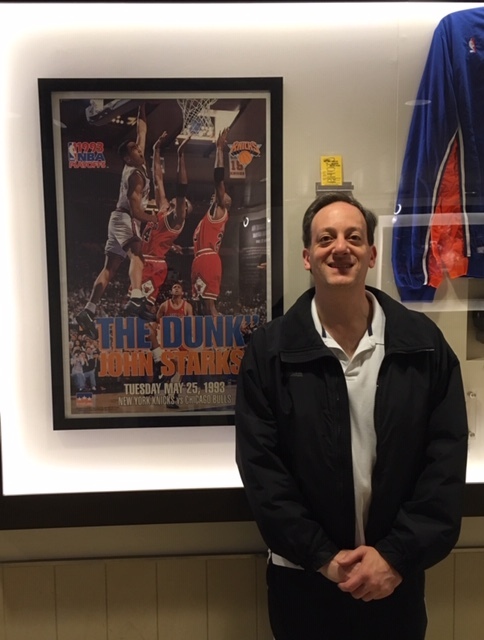 I arrived early to soak up the atmosphere and I very much enjoyed looking at the memorabilia that is displayed on the concourse, including the boxing gloves autographed by Muhammad Ali and Joe Frazier (first picture), a practice-worn Patrick Ewing jersey (second picture) and a poster of John Starks' dunk versus the Chicago Bulls near the end of game two of the 1993 Eastern Conference Finals (third picture). During the pre-game warmups, I noticed that Dirk Nowitzki can barely move. The 40 year old's gait is very unsteady. It is sad to see an all-time great whose mobility is so limited. However, the other thing that I noticed is that he can still shoot stand-still jumpers; from a pure shooting standpoint, he looks the same as always. Nowitzki is one of just five players who have played 21 seasons (Robert Parish, Kevin Willis, Kevin Garnett and Vince Carter are the others) and he is the only member of that group who spent his entire career with one team. Nowitzki received a standing ovation when he first entered the game. This was my first opportunity to see 19 year old rookie sensation Luka Doncic in person. While Nowitzki is likely making his final Madison Square Garden appearance, this was Doncic's Madison Square Garden debut. His first shot was an airball but Doncic was not fazed and he had a solid overall game: 16 points on 7-18 field goal shooting (including 2-9 from three point range), eight rebounds and five assists. Doncic is a skillful ball handler who has excellent size, court vision and passing skills. He has a nice shooting motion and he has the ability to score in many different ways from a variety of areas on the court. TNT's Kenny Smith often notes that the margin between bad teams and good teams can be rather small throughout the course of a game; as he puts it, if a team loses by two possessions each quarter, it is only trailing by four after one quarter and eight at halftime but at that pace the game will result in a 16 point blowout. That was pretty much the story of this game. Dallas led 55-47 at halftime. The Mavericks, 23-27 after this game, are hardly a juggernaut but they are a level above the Knicks, who dropped to a league-worst 10-40 (after losing to Boston on Friday night they are now 10-41). Doncic hit a three pointer to put Dallas up 72-56 at the 7:17 mark of the third quarter and the Knicks never seriously threatened the rest of the way. The main source of excitement/drama, such that it was, turned out to be the "We want Kanter!" chants from the crowd. The Knicks are in full tank mode and thus have essentially removed Enes Kanter from the lineup lest he spoil their chances to potentially obtain the number one pick in the draft--but with the game safely out of reach, Coach David Fizdale gave in and let Kanter see some action. Kanter seemed genuinely happy and surprised to get to play; he has publicly made it very clear that he does not agree with the tanking plan, nor with being benched in favor of less productive players. After Kanter checked into the game the crowd cheered and he went straight to midcourt, where he knelt down and kissed the Knicks' logo. Kanter finished with five points and two rebounds in nine minutes of action. The next source of excitement/drama was the "We want Dirk!" chants in the final moments of the fourth quarter. I was not sure if Coach Rick Carlisle would put the future Hall of Famer with the creaky legs back in the game--and I was a little concerned that Nowitzki might pull a muscle or something after cooling down on the bench for so long--but Carlisle gave the fans what they wanted and the fans again gave Nowitzki a rousing ovation. The cheers were even louder after Nowitzki made a three pointer at the 2:42 mark of the fourth quarter to put Dallas up 112-83. I assumed that Carlisle would then take Nowitzki out but Nowitzki stayed in a bit longer and his final points of the night came on a jumper at the 1:38 mark that made the score 114-85. Nowitzki finished with a season-high 14 points on 5-7 field goal shooting in just 12 minutes. He did not have a single rebound, assist, steal or blocked shot; even the mere act of boxing out seemed to be quite a task give his current lack of mobility but it is worth noting that he scored 24.9 ppg in his previous 17 Madison Square Garden appearances, his highest average in any road arena. He was a great player and he seems to be able to accept his limitations and enjoy his limited role during his farewell tour; not every great player would be comfortable going out this way but if he is happy with it then that is nice for him and for his fans who get to see him one last time. Dallas won 114-90 but the final score was almost an afterthought; the focus was on the past (Nowitzki) and the future (Doncic). Harrison Barnes led Dallas with 19 points but he does not look anything like the franchise player that Mark Cuban thought he was signing; Barnes is a solid player but nothing special and you can go several minutes without even noticing that he is on the court. He does not have the presence or impact of a great player. Dennis Smith Jr. posted his second career triple double (13 points, 15 rebounds, 10 assists) and he led Dallas with a +23 plus/minus rating. Wesley Matthews chipped in 17 points. Kevin Knox led the Knicks with 17 points and Trey Burke added 16 points. The Knicks went 1-12 in January after going 2-12 in December. Their only win since December 14 is against the L.A. Lakers (sans LeBron James) on January 4. I enjoyed soaking in the Garden's historic atmosphere and it was special to see Nowitzki's Garden finale/Doncic's Garden debut but as a basketball purist/historian/analyst I cannot emphasize enough how bad tanking is for the NBA game, the NBA brand and the NBA product. Under normal circumstances I would not want to watch--let alone comment about--a game played by a tanking team but making a first visit to the Garden is special, as is having the opportunity to bid farewell to Nowitzki while welcoming Doncic. Postscript: The day after this game, the Knicks and Mavericks did a blockbuster trade that sent Kristaps Porzingis (who has yet to play this season due to injury), Tim Hardaway Jr., Trey Burke and Courtney Lee to Dallas in exchange for DeAndre Jordan, Wesley Matthews and Dennis Smith Jr. The Knicks also acquired two first round picks from the Mavericks. Publicly, the Knicks stated that they traded Porzingis--who made the 2018 Eastern Conference All-Star team shortly before suffering a season-ending left ACL tear--because Porzingis had informed them that he did not plan to re-sign with the team. The reality is that Porzingis will be a restricted free agent after the 2019-20 season, meaning that if the Knicks had extended a qualifying offer to him then they could have matched any contract offer he received. So, Porzingis was supposed to be the franchise's cornerstone player and now the Knicks have given him up for a past his prime Jordan, spare parts and a couple draft picks. The obvious goal/hope/fantasy is that the Knicks will be able to use the salary cap space that they have cleared to sign two max contract stars who will instantly turn the team into a contender. The reality is that the Knicks have been mismanaged for decades and I would be surprised if a superstar player who can play wherever he wants to play decides to cast his lot with a dysfunctional franchise. Due to the salary cap rules that require teams to spend a minimum amount, the Knicks will end up using that extra cap space whether or not they attract a superstar, which means that the most likely scenario is that they will end up overpaying for someone who is not really a superstar. Maybe Porzingis is damaged goods who will never be the same. Maybe the Knicks have a wink, wink, nudge, nudge agreement to sign a free agent superstar this summer (which would of course violate NBA rules if it could be proven). This may turn out well for the Knicks but that does not mean that--based on what is currently known and the options that the Knicks had--this was the optimal move. If the Knicks are so dysfunctional that an All-Star who they drafted and groomed to be a franchise player wants out then why would any top player sign with the Knicks?